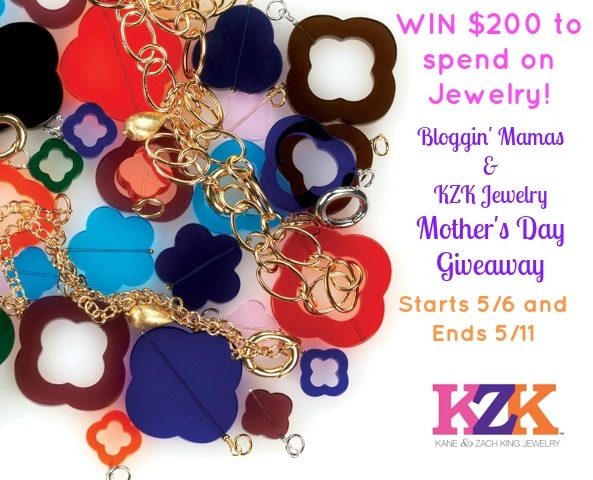 #GiveAway: KZK Jewelry Mother's Day! I have teamed up with Bloggin' Mamas and KZK Jewelry to offer you an awesome giveaway, just in time for Mother's Day. Great style does not have to be complicated. KZK Jewelry and the idea behind it is super practical. Look effortlessly chic no matter what combination you put together. Pick your chain. Pick your pendants. It's so simple. It's so versatile. It's your own customizable jewelry collection. Their look book can be found by clicking on this link: https://s167603.gridserver.com/lookbook/ To create jewelry that's both beautiful and versatile, you simply “attach” and detach pendants to the chain you choose for a myriad of stylish looks. One necklace, multiple looks. What's better than that for the busy, stylish woman on the go? The chains come in sterling silver and gold filled. And there are over 150 pendants to choose from including semi-precious stones, horn, pearls, druzy, agate, crystal, etc. Prices for the chains range from $55-$285 and prices for the pendants range from $9-$74 (with some special one-of-a-kind pendants ranging from $98--$198). Please also check out their web site at www.kzkjewelry.com for more ideas and inspiration. From now until Mother's Day, you can get free shipping when you use the code KZK4Mom Order by 5/7/14 to guarantee Mother's Day delivery! The giveaway starts 5/6/14 at 12:01am EST and ends 5/11/14 at 11:59pm EST. It is open to United States Residents 18 and over. Winner will be selected via random.org and notified via email within 48 hours after the drawing. Winner will have 48 hours to respond or a new winner will be selected. Winner's name will be displayed via the Rafflecopter widget below.